For a few days every October the residents of Stratford-upon-Avon have the history of the town brought home to them. The centre of the town literally comes to a standstill, all the cars, buses and lorries that pound the streets banished. First thing in the morning the roads are still, and pedestrians claim the centre of the roads without having to dodge traffic. Of course the annual Mop Fair isn’t in any real sense a medieval fair. Walking through the streets you have to be careful to avoid the electrical cables that power the rides. And it doesn’t stay quiet for long. The sounds are the noisy music of the rides and the shrieks of the riders, the smells of frying onions and candy floss, the brash lights in all colours of the rainbow. What makes the Mop Fair different from most fairgrounds is that it takes place in the medieval streets of Stratford, just as it has for hundreds of years. 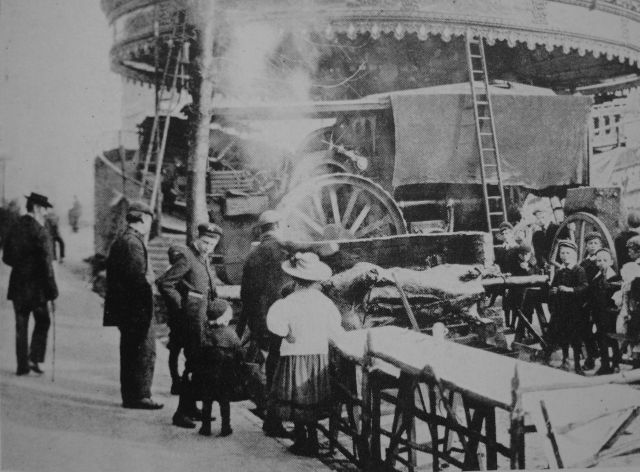 This great photograph posted on Flickr by Mr Stezz shows the fair among the buildings of Rother Street and Greenhill Street. Stratford’s position on a strategic route at the crossing on the river Avon amidst productive agricultural areas was responsible for its success as a market town. 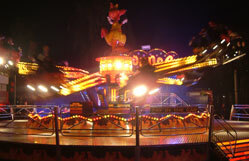 As well as the weekly markets at least four fairs were held in the town during the middle ages. When the town received its Charter of Incorporation in 1553 the weekly market was confirmed along with two fairs, to which were added another three in 1610. There were several different types of fair. A town guide dated around 1800 listed some of the commodities traded: cattle, cheese, hops, horses, sheep, and “A Statute or mop, for the hiring of servants, is also held on the morrow after old Michaelmas-day”. This early version of the job centre fitted those who needed workers with people hoping to find employment. 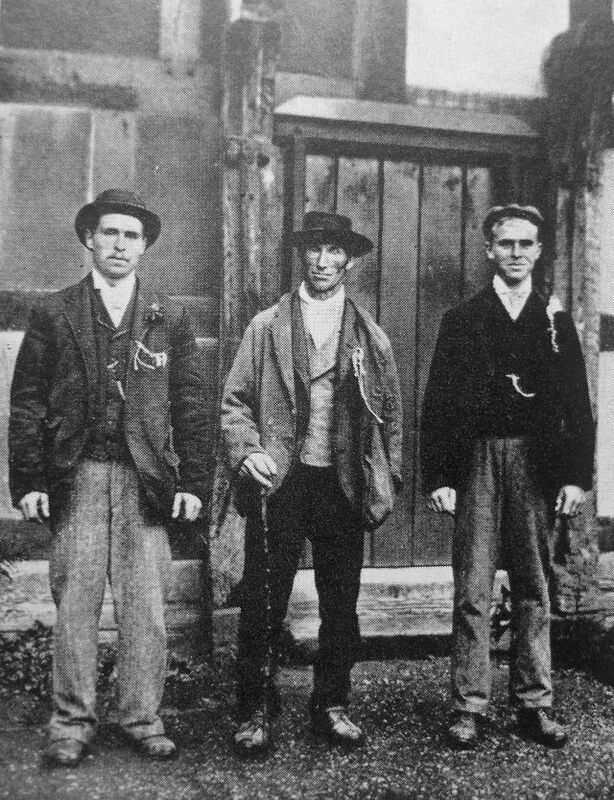 In Shakespeare’s day they would probably have been mostly agricultural workers, but the heyday of the hiring fair was the nineteenth century when as well as farming, many people went into service. The photograph shows three men looking for work, each one bearing a sign of his craft in his lapel. Inevitably there were many other activities at the fair. There were ox and pig roasts, perhaps again because of the traditional importance of livestock farming, in which Shakespeare’s father was indirectly involved as a glover dealing in animal skins. 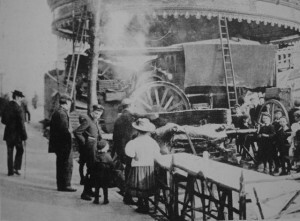 Each of the public houses (and Stratford had many public houses) had its own animal roast, and even today there is a pig roast, the only traditional element of the fair that still remains. The fairs would have been pretty lively occasions, with various goods and services on offer. Shakespeare was obviously familiar with them. In The Winter’s Tale the rogue Autolycus “haunts wakes, fairs, and bear-baitings”, selling trinkets including “ribbon, glass, pomander, brooch, table-book, ballad, knife, tape, glove, shoe-tie, bracelet, horn-ring” as well as picking pockets “so that in this time of lethargy I picked and cut most of their festival purses”. The Mop goes on until midnight on 12 October. But by the following morning, all sign of the fair has gone. The rides themselves, the sideshows, the stalls, even the rubbish. Ten days later the traditional runaway mop, the little brother of the main fair which gave people a second chance to find work, appears. Coming in October the Mop now is a sign that winter’s on the way: it signals the beginning of the build-up to Christmas, with the Christmas lights starting to go up soon after. A few years ago there was a suggestion that the Mop Fair should move out of the town centre to somewhere where the disruption to the town could be avoided. A local referendum was taken which showed that local people valued this link to the past and wished it to continue. For me it’s a valuable reminder of the history and origins of Stratford-upon-Avon. This entry was posted in Shakespeare's World, Stratford-upon-Avon and tagged agriculture, Autolycus, fair, Mop Fair, Shakespeare, Stratford-upon-Avon, The Winter's Tale. Bookmark the permalink.